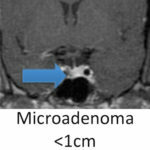 Majority of pituitary adenomas are small and do not require any treatment. 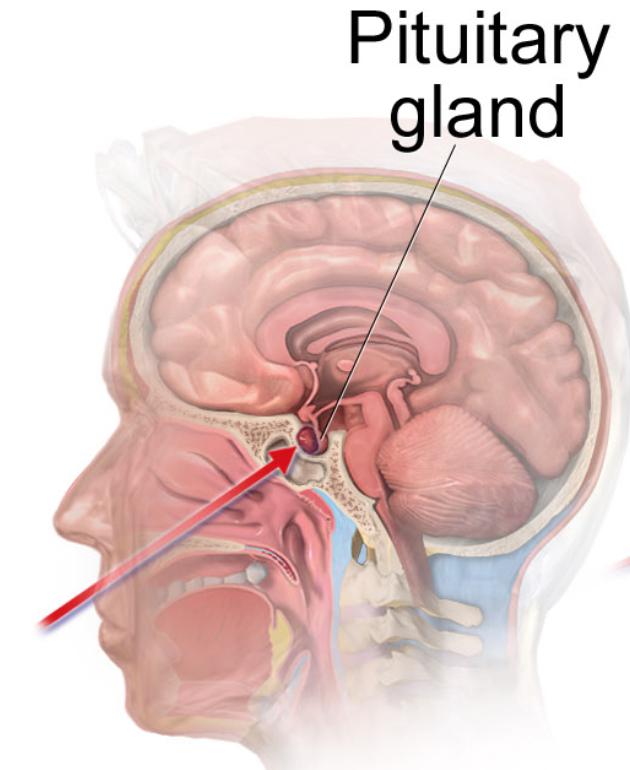 The pituitary gland sits at the base of the skull and can form a tumor called a pituitary adenoma. About 10-15% of adult brain tumors that start in the brain are pituitary adenomas. It is estimated that asymptomatic pituitary tumors may be present in up to 25% of people. 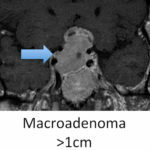 The majority of pituitary adenomas are small (less than 5mm) and do not require any sort of treatment. However, two scenarios exist in which something needs to be done. The pituitary gland’s normal function is to secrete hormones. When an adenoma occurs most do not secrete any excess hormone. However in some cases, the adenoma secretes excess hormone and causes symptoms. Most of the time (40-60%), the tumor secretes a hormone called “prolactin” which causes lactation from the breasts in both men and women. About 30% of the time, the tumor secretes a hormone called “growth hormone”. In kids, this can literally cause you to become a giant. In adults, excess growth hormone can cause changes in hand size and facial features. About 15-25% of the time, the tumor secretes a hormone called “corticotropin”. This can cause symptoms including obesity, diabetes, high blood pressure and high cholesterol.When the tumor secretes excess hormone, the symptoms need to be addressed. There are medications that can reverse the excess prolactin, called Cabergoline or Bromocriptine. Many prolactin-secreting tumors will actually shrink in size and stop secreting the hormone with the medications and no surgery needs to be performed. However, excess growth hormone or corticorpin can be dangerous and so these tumors often need surgery to remove the tumor and stop the excess hormone secretion. 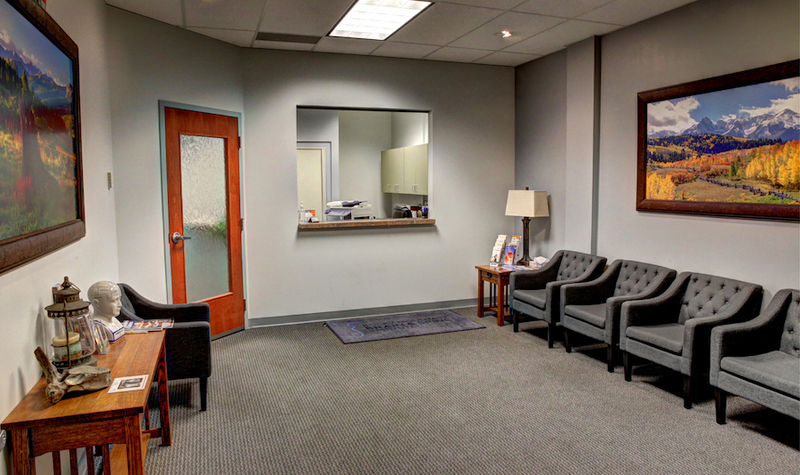 While most adenomas either secrete no hormone and stay small and unnoticed, or the adenoma secretes excess hormone and causes symptoms, sometimes the adenoma grows very large and causes compression symptoms. 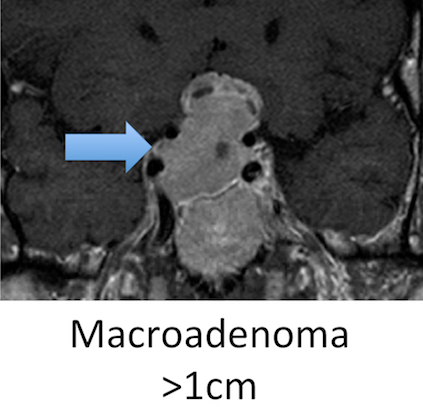 If the tumor becomes larger than 1 centimeter is size, it is called a “macroadenoma”. 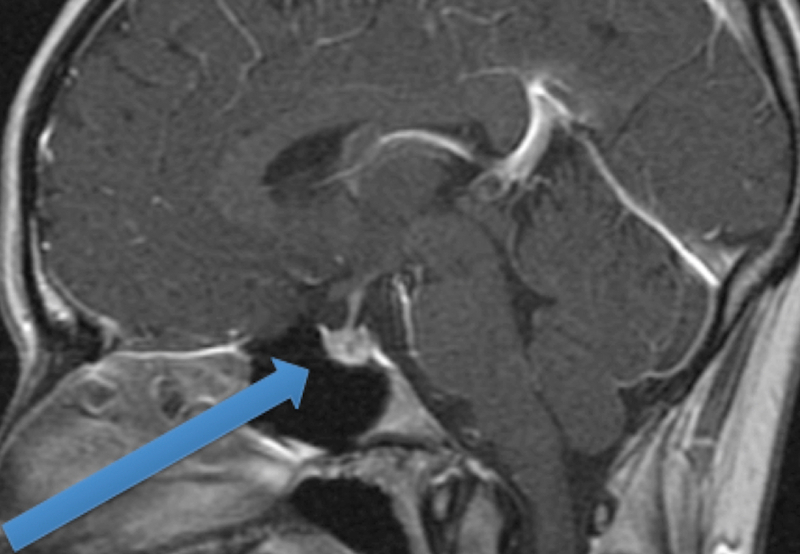 When this occurs, the tumor may press on important brain structures like the optic nerves. This can cause loss of vision so surgery is necessary. A patient with a pituitary adenoma should see a neurosurgeon and an endocrinologist. 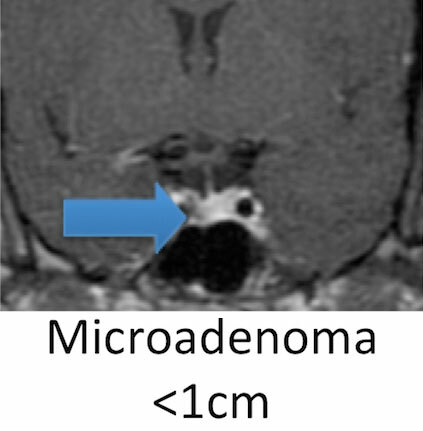 If surgery is necessary, most pituitary adenomas can be removed in a minimally invasive fashion. No actual incision is visible, and the tumor is often accessed by using a camera (endoscope) or microscope through the nose. After surgery, patients stay overnight in the intensive care unit but often can go home the next day or within a few days. If the adenoma is very large, sometimes the tumor needs to be partially removed through the nose but the rest needs to be removed by performing a craniotomy. A craniotomy involves making a larger incision on the side of the skull to approach the adenoma from the side as well. Some tumors can be treated with radiation, however this usually is reserved for tumors that recur following surgery or multiple surgeries. If you have a pituitary tumor, make an appointment with our BOARD CERTIFIED neurosurgeon at Rocky Mountain Brain & Spine Institute.